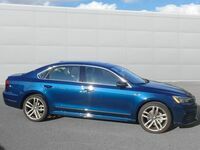 Just when you thought the Volkswagen Passat couldn't get any better, engineers went and gave it 20 different interior and exterior additions along with a fiery V6 engine to make it a true sport sedan capable of almost anything! The 2018 Volkswagen Passat GT is here to bring the fire thanks to a new engine, lowered suspension, and plenty of progressive design elements that are based on Volkswagen's R-Line® trim. Take a look below as we explore its fresh new look and read more about the impressive performance features that power this sporty car. .
At first glance, the 2018 Volkswagen Passat GT looks like a souped-up Passat SEL, but added features such as the R-Line® bumper, honeycomb grille, GT badging, and red accent lines take it from sophisticated to sport. Work your way around the new Passat GT and you will find a black roof that is complemented by black mirror caps, black window trim, and door trim. Other notable exterior features include two-tone 19-inch “Tornado” wheels, red-painted brake calipers, and a black spoiler. For added interior design, you will also find piano black trimming and carbon fiber-optic décor. So, besides its design, what makes the new Passat GT different from the rest? For starters, it comes standard with a 3.6-liter VR6® engine that has a horsepower rating of 280 and a torque rating of 258 lb-ft. The engine is then mated to a six-speed DSG® automatic transmission with Tiptronic® and paddle shifters. To handle the extra power, this sedan is outfitted with a sport suspension system to give it a more planted stance. Finally, even with all that power, the new Passat GT is able to get up to 28 miles per gallon of gas on the highway. If you would like to get up-close-and-personal with the 2018 Volkswagen Passat GT, get in touch with us today at Dirito Brothers Volkswagen!